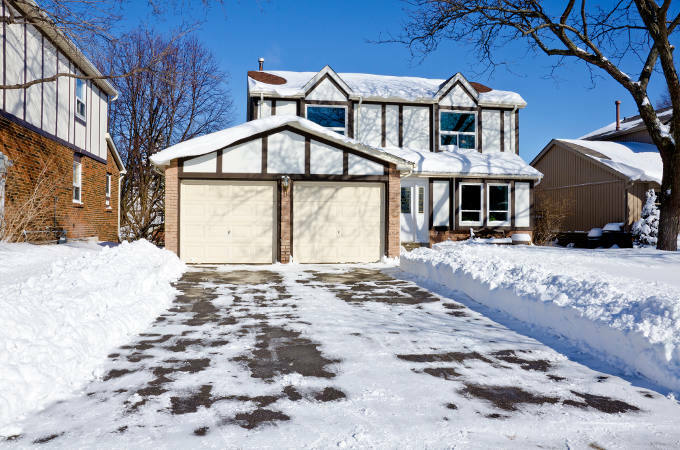 Winter takes its toll on all parts of our homes, but garage doors often get forgotten about in the hurry to get back inside to the warmth. Most households actually get more use out of their garage doors over the colder months (it saves you defrosting your windshield every morning), so it only makes sense that you give it an occasional once-over to keep it functioning properly. Here are four easy ways to make sure your garage door is working as it should be, to save you the hassle of a faulty door over the winter. Garage doors do a pretty good job of standing up to the elements, but whether they’re made of steel, wood or GRP, they do need a wipe down every so often. Use a large sponge, a bucket of warm water and some gentle detergent – washing up liquid is fine, but an eco-friendly cleanser will save you the hassle of preventing it running into the drains and contaminating local water. Afterwards, make sure the door has been properly rinsed with clean water. Winter is usually the time of year where garage doors feel heavier and mechanisms jam up. If you haven’t already, make sure that you lubricate all moving parts (hinges, springs, rollers etc.) to keep it opening and closing smoothly. A silicone-based spray from your local hardware shop will work a treat, although WD-40 will be fine for the short-term. If you have any automated features on your door you should regularly test that they’re working properly. This is particularly important now that the nights are drawn in, as malfunctioning mechanisms present a much greater hazard in the dark (and nobody wants to end up in A&E as the person that walked into the garage door). Safety sensors can be checked by setting the door to close and then breaking the beam inside, which should make the door reverse its motion. Equally, setting the door to open and then lightly pushing the door closed from the outside (as if it’s bumping into a parked car) should make it stop and change direction. Every so often you should check that your garage door is properly balanced, which is key to it opening and closing with minimal effort on your part. Close the garage door, and if you have an electric opener this should be disconnected. Next, manually open the door about a quarter (approximately 45 degrees) and carefully let go. If the springs are too tight the door will continue to rise, while loose springs will cause the door to drop closed. A well-balanced door should barely move. If you have any concerns about the way your garage door is working you should always call out a professional. Do not try and adjust the mechanism of your garage door yourself! Our number one concern is your safety, and our technicians will be happy to help no matter how big or small the problem is. You can get in touch by calling 0800 161 3733, or by completing the form on our contact page.